Step 3: On next page, enter email or mobile id and password. As per reports, nearly 15 lakh untrained teachers have registered with the National Institute of Open Schooling (NIOS) to pursue an online diploma course in elementary education. Clearing the exam successfully, they’ll become eligible for the teaching job by March 2019. Of them, as many as 3.53 lakh untrained teachers are from the government schools while the rest of the teachers have come from the private schools. The highest number of untrained teachers (2.85 lakh) registered for the course are from Bihar while from Uttar Pradesh, there are 1.95 lakh teachers registered for the NIOS exam. Teachers, who teach primary school classes up to Standard V, are expected to have a D.El.Ed over and above any qualification that they may possess. In the absence of a D.El.Ed, primary school teachers are considered ‘untrained’, even if the teacher holds a Bachelor of Education (B.Ed) or Master of Education (M.Ed) degree. NIOS D.El.Ed Identity card 2017 at dled.nios.ac.in for D.El.Ed. 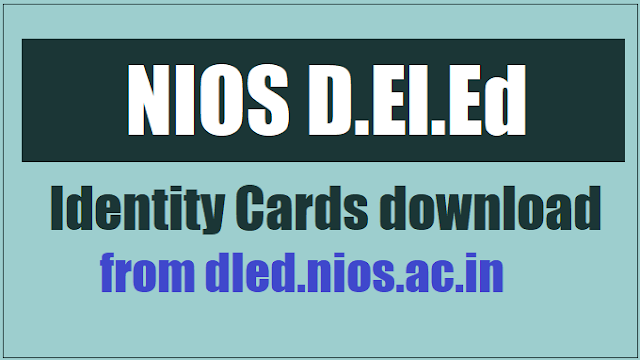 registered teachers, National Institute of Open Schooling (NIOS) Identity cards, National Open School Identity cards, Online diploma course in elementary education.